Sherlin’s own brand of heavenly Comfy Sock- the name says it all. It's like walking on a cloud and so comfy you'll never want to take them off! Sherlin’s Comfy Socks are ideal for wearing around the house, in slippers or great as a bed sock. The richness and plush feel of these Comfy Socks keep your feet snuggly and toasty warm but still able to breathe. They are fantastic for people who like a loose knitted top to the sock and are especially good for diabetics or people with circulation issues. 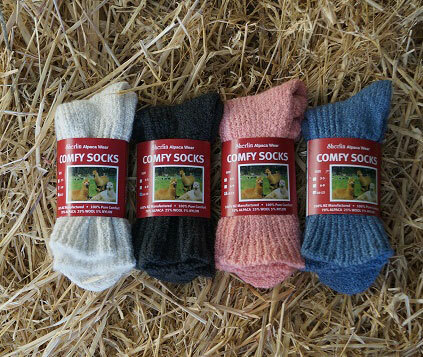 Comfy socks are made with 70% Alpaca, 25% Wool and 5% Nylon with 100% pure comfort Alpaca fleece sourced from Sherlin’s own Alpacas. Fibre yarn and socks manufactured in the South Island of New Zealand.